Despite losing four prime seasons to World War II and another to a fractured wrist, Hank Greenberg still walloped 331 home runs, including 40 or more on four occasions. The MVP in 1935, when he drove in 170 runs for the pennant-winning Tigers, the slugging right-hander drove in 183 runs in 1937. In 1938, he made a strong run at Babe Ruth's home-run record, finishing with 58. He hit .318 in four World Series with Detroit. 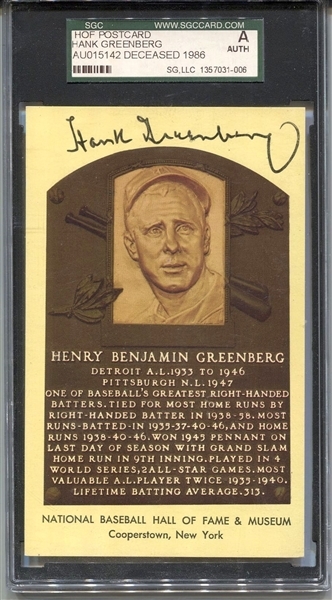 Offered is Greenberg’s signed gold/yellow Baseball Hall of Fame plaque postcard signed in his signature black felt tipped pen. Encapsulated Authentic by SGC.